Poss a bit niche for the initial deal here, but working out at £17.48 per item there are some nice bundle deals to be had. The items from my example above are below, but obviously there's loads of configurations, like adding wheels and stuff like that, or clothing. 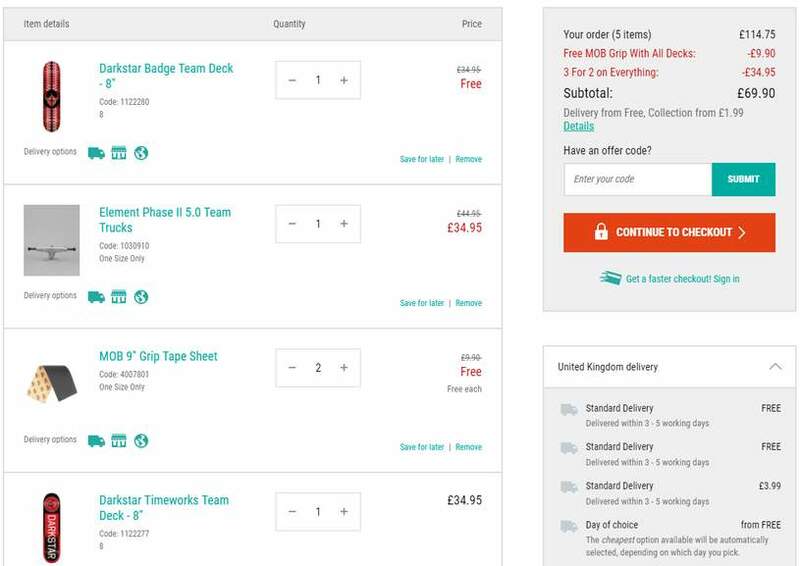 Would probably not go for skate bearings if buying more expensive items, mainly because it's the cheapest item that goes free and I'd personally get a £30 item free instead of a £10 item Anyway, take a look and see if there's anything for you. Excellent deal to get yourself a complete set-up. It's only getting stronger. Within 4 mile radius there is 5-7 brand new parks being built up by me. Our most recent park had a budget of £345,000 (finished project about £180,000). Worth adding that if you put wheels, trucks and a deck to your basket you get a free hardware pack along with free grip tape. ooh the memories Santa Cruz boards, Tracker trucks and bones wheels. Shame i'm over the hill, used to skate in the late 70's to early 80's …Shame i'm over the hill, used to skate in the late 70's to early 80's loved it ;-)Voted hot btw.ooh the memories Santa Cruz boards, Tracker trucks and bones wheels.